When to DIY vs. Hire for Business Branding — The Higgins Creative. If you’re well-versed in the culture of online entrepreneurship, then you’re aware of the plethora of courses you can take to build a business. You can build your own blog, set up sales funnels, run Facebook ads, and make your own graphics on Canva. You can spend hours on Pinterest looking at blog posts from others who’ve been successful when doing everything themselves. However, an entrepreneur who can learn to build a profitable business from the ground up alone has two assets: a large mental bandwidth and a lot of time. I’ve done the course phase for too long and felt only one thing--brain exhaustion and burnout. My mind felt fried, and when you combine that with tiredness, then it leads to, well, doing nothing at all. When it comes to branding, you should know when it’s good to plan ahead and get it done yourself, or search for the right professional to build your branding. This is the main reason you should consider DIY over hiring. You’ll need to be consistently learning from through articles, courses, or a mix of both. In the beginning, when you’re new to everything, learning about branding will be a part-time job! If you just opened up shop, it’s definitely not time to hire. Consider courses and cheap options on Etsy to fill your branding needs. The reason is that you have not figured out the ins and outs of your business. You haven’t found what symbolizes your brand, the vision, and the voice. Most business owners don’t have the same concepts at the start as they do within a year or so of working. That means you’ll most likely be changing it. Many business owners have rushed to get branding work done. They love the appeal of the beautifully designed logos and websites and think “I need this!”. However, if you’re working with a good designer, they will need your details mapped out well. Not knowing things like your mission, vision, target market, and competition is a recipe for disaster. You will end up with a logo that doesn’t make sense. I always get questions on how to DIY your brand correctly. So I finally put together this eBook called DIY Branding. It will give new or budget-conscious business owners a head start in branding their dream businesses! You’ll learn how to make proper guidelines for your brand and have full control of everything! You can get the eBook here! I know this is a pretty obvious point, but new business owners sometimes believe everything can be done all alone. But many of them also haven’t calculated their worth and what lost time means for them. The amount of hours it takes a professional designer to create your brand will be in half the time or less than it will take you. Not to mention, it will be crisp, clean, and super professional! When I mean running, I also mean that you’re making money and you’re of aware of your customers. The biggest mistake I’ve seen people make is hiring someone before they can learn about what their business actually needs. Part of the branding process is the designer researching what types of graphics appeal to your target market. If you list 5 different types of customers, then you don’t know yet who you’re actually appealing to. Small businesses usually market to one type, and don’t worry-- doing so does not close doors for others to buy from them. If you’ve reached a point in your business where you can hire, branding should be the first step. A cohesive look goes a long way into how your potential clients will view you. You pay for the branding one time, and the best part is that the design is yours forever. Unlike paying for ads and services with temporary results, your branding will be remembered as long as you’re in business! Designers who are new to freelancing and entrepreneurship usually struggle with the same thing: branding themselves and building their business with consistency. Ask yourself a few questions about where you’re at. Do you know what kind of clients you should take? Do you know how you can make a decent living? Do you have the ability to pass up a client and refer to DIY? Do you know how to scale? I probably knew the answer to one of these questions, even after being a freelancer for a while. I always thought it was an unpredictable gamble and that most freelance designers were poor. The one step I was missing was hiring a coach. The important thing is to find a coach who is transparent about their goals and successes, and can share that with you. It was around the time I was ready to scale and get serious, Lilah came out with the Income by Design Mentorship. Not only did I learn about how to run my business in an organized and professional manner, but the accountability boosted my motivation to get more clients. If you want your business to grow, invest in something that’s tailored for you. Franzine Mackley is a graphic designer and brand consultant at Breezy Camper. She helps entrepreneurs with building their brands. With years of experience in marketing and design, she can create the perfect mix of aesthetic and function for ambitious bosses. When she’s not in front of her computer, she’s roadtripping with her family. 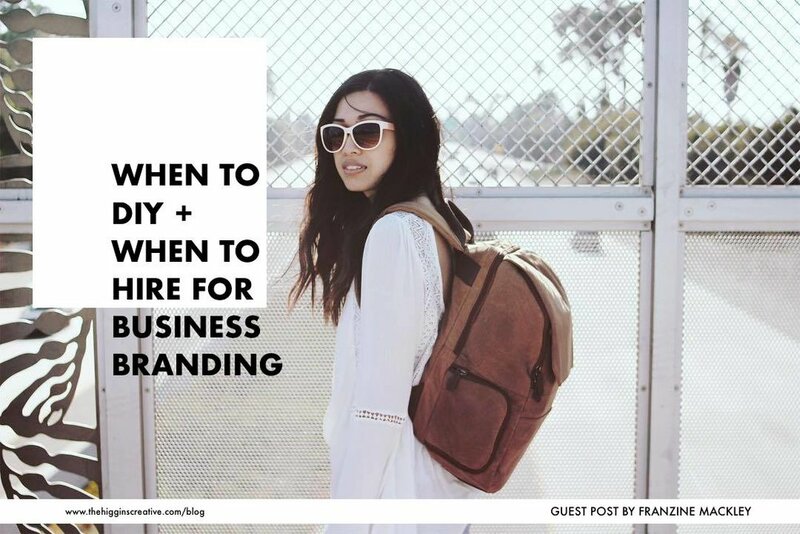 Check out her eBook DIY Branding for a more in-depth look into solidifying a brand.